If you’re lucky enough to live in this amazing Mexican Paradise we call Riviera Maya, then you have a commitment to it and everything in it. There are many ways you can help taking care of this beautiful place we call home. If you’re visited a cenote or a theme park such as Xcaret, you’ve heard this before. Chemical sunscreen and bug repellent contaminate water, poisoning fish and plants. If you just can’t get rid of mosquitoes, try to use plants around the house that repells them, such as the already famous citronella (lemon grass), lavender and basil, among others. Cinammon and coffee grounds will keep the ants away from your precious flowers. Cinammon also works as rooting hormone. Yes, you’re in a hurry and you have to buy whatever you need in that moment. But stop a minute and think of all the garbage you’re leaving behind. Unfortunately, most to-go food packaging in Mexico is made of polystyrene foam (styrofoam), which represents half of the marine garbage on the planet. Consider taking a “tupper” if you think you’re getting leftovers from your restaurant meals, and take them home on a fabric reusable bag. Same with the supermarket goods. And most of all remember: no straws! We’re thankful enough that animals in circus are forbidden. But endemic species such as jaguar cubs, parrots, monkeys or iguanas are trapped to serve as “picture buddies” in hotels or even the streets. The profit encourages hunters to trap even more animals that ends up in endangered species. Sometimes, you’ll see people trying to sell you certain kinds of food in a very suspicious way. Don’t buy them! Octopus, grouper, and other seafood species have a seasonal ban, but deer, pink conch and turtle (and their eggs) trade is forbidden, under de risk of jail. Be careful. Let the population of these species grow and recover. It’s easy to leave the water running while brushing your teeth, take long showers or throw away that piece of burger. Please, think twice before making any waste. There are lots of recycling programs. Some of them even give you native plants in exchange for your garbage. • 900 sq. ft., 1 bath, 1 bdrm single story – $139,000. priced to Sell ASAP!!!!!! 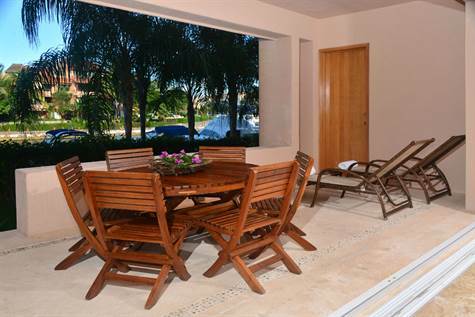 Puerto Aventuras, Quintana Roo – Las Palmas S-1 is a lovely and spacious one bedroom condo filled with light. 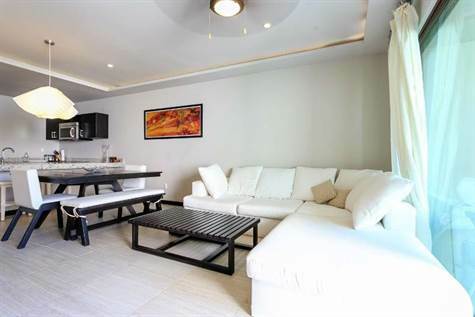 (00 square feet is practically the size of many new two bedroom two baths in Puerto and Playa del Carmen. Thus the kitchen, dining room and living room q and unusually large and beautifully furnished. The terrace overlooks the gold course and is very private. You catchthe tail end of the pool. There is a half bath with built in (cabinets) laundry which is very handy. Then a large master with king bed, good closets and cabinetry and leads to a spacious again, ensuite bath with huge walk in shower. This attractive condo is a not so small package at a small price.!!!! Don’t miss it!!!!!! Faithful to its Catholic tradition, the Mexican people celebrate each year Semana Santa, a reminder of the time when Jesus Christ died on the cross. Semana Santa includes both Holy Week and Easter. The Holy Week, beginning on Palm Sunday and ending Easter Saturday) and Pascua (Starting with Easter Sunday and ending the following Saturday). This year, it starts on April 9th and ends on the 22nd. It is a period of fasting and reflexion for the believers. You can see ceremonies, rituals and representations of the Passion or Viacrucis. (the walk of Jesus with the cross on his shoulders) in every city. Many people decide to not eat meat during the Holy Week, so seafood shops can get crowded. At the same time, they increase their stock with a variety of very fresh items. This holiday is so important in Mexico that many places stop any activity Holy week’s Thursday and Friday, such as banks, government offices and institutions. Schools are also closed during the two-week period. It increases the national tourism in every part of the country, specially on the beach areas. You’ll see buses traveling all over the highways. Big Mexican families rent them to move together from one place to another. This is a relief for commerce and services industry, which find in this period a good way to earn some profit before low season. You’ve already heard about the magnificent city of Chichen Itza in the Mayan world, and you probably know about how it is part of one of the most wonderful astronomical phenomenons ever existed. The descend of Kukulkan, the feathered snake, during the spring equinox. Hundreds of people from all over the world gather together at the base of the pyramid to receive the blessing of Kukulkan or to simply enjoy the amazing phenomenon. Chichen Itza is located in the state of Yucatan, just a couple of hours away from the Riviera Maya. It’s spring and the Riviera Maya shows its colors! It doesn’t get better than this! The Mayan Riviera has usually a full green landscape, being the endemic floral species mostly in different shades of yellow or strong violet. Walk ins welcome to our office! If you’re already enjoying a wonderful vacation in Puerto Aventuras and you’re planning to stay forever, come visit us! We have the best listings in town and we’ll find you a property that suits your budget and expectations. • 1,600 sq. ft., 2 bath, 2 bdrm single story – $280,000. PRICED TO SELL!!!!! Puerto Aventuras Beachfront, Puerto Aventuras – H 102 is your wonderful new home away from home. Located in the well known Chac Hal Al condominium just steps from the marina, beach, OMNI Hotel an Centro Comercial Marina with it´s myriad shops and restaurants, H 102 has a spacious, 1600 square foot, lay out area featuring two bedrooms and two and one half baths and an open plan kitchen with very large living and dining areas. The master bedroom opens onto the ground floor terrace, and what a large terrace it is. Have your morning coffee there, a tranquil lunch or afternoon cards and cocktails before venturing forth to dine at one of the many restaurants ringing the marina. Stop on the way back for dessert and live music at Cafe Ole! Days can be spent on the private beach or lounging at one of Chac´s two pools, or for the more energized, sports fishing, snorkeling or scuba diving….or visits to the many cenotes and or ruins in the area. Returning to that wonderful terrace for a cold beer followed by a nap there or in a cool bedroom! H 102 is the place to be!!!!!! Villas del Mar D202 is bright with a cool breeze coming straight from the beach. This beauty has been recently repainted. $430,000 USD. Comfort and beauty in one place! A discrete interior decor contrasting amazing and colorful outdoors. Outstanding simplicity! Villas del Mar II 206 has it all!